DJ Byron Cooke @byroncooke On Twitter: "..Adam Lambert Is Calling Into The @fififevandbyron @FoxFM Next Week..""
From radio DJ Byron Cooke @byroncooke (and long term Adam Lambert fan!) On Twitter: "..Adam Lambert Is Calling Into The @fififevandbyron @FoxFM Next Week.."
@byroncooke: "Just found out that @adamlambert is calling into the show next week 🤘 Excited to catch up... it's been a while! @fififevandbyron @FoxFM"
The show originates in Melbourne, Australia. This is a quick heads up: more info about date & time later! Great! Adam & Byron's interviews are always a hoot!!! Glitzylady, what do you mean by 'The show originates in Melbourne, Australia.'? The first concert in Australia this year is in Sydney on February 21. Such great news! Byron and Adam have been buddies for a long time now. Byron jokes about wanting to be Adam's boyfriend. LOL. fluttsp, I'm assuming the interview will be on the phone, so doesn't matter about the tour schedule. But it sure would be fun to see Adam do a live, in-person interview wit Byron sometime. I remember that first live interview with Byron. He was definitely "hitting on Adam" back then. Adam rebuffed him by telling Byron he was too "rough and scratchy", or something like that (re: his beard, I guess)...and therefore not his (Adam's) type. I think Byron mentioned something about just coming out of a divorce, and indicated that Adam appealed so much to him that he wanted to date him. Anyway, it was a good while ago, and I was never sure how serious Byron was, but Adam seemed a bit taken aback and reluctant to hurt Byron's feelings...but was quite definite about turning him down. Byron has always been a big fan of Adam's since that first interview, and every time since then their banter has been amusing. 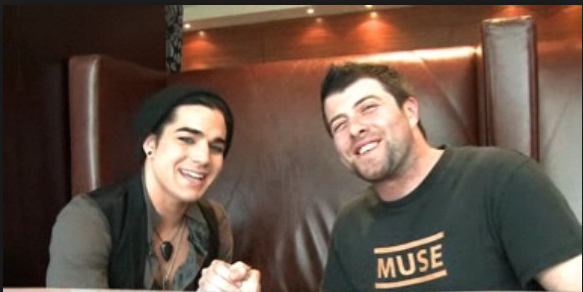 Adam Lambert with Byron Cooke UNCUT March 2010. Thanks for linking that first interview! I haven't watched it in a long time. Those two guys just had a natural rapport from the very first moment. Every interview they've done since has been lots of fun. Can't wait for the next one! (and I would still love an in-person interview, too). Byron has been a loyal Adam promoter since Day One. Mirela, thanks for that link....it was pretty much how I remembered it. I am struck by how delightful Adam's interviews have always been. He always maintains eye contact, is very forthright, relaxed, articulate, intelligent, unaffected, funny...and C-H-A-R-M-I-N-G. The only thing that may have changed over the years is that he just gets BETTER-ER! Here's one I love from 2015..."What's the Goss?" Maybe Adam compile an DVD of some of his best interviews. Sorry....I meant ..."Maybe he SHOULD compile a DVD...."